For some interesting reading this weekend, here's an old article that explores a robotic laser cutting system at Raleigh Bikes of Canada, reasons to invest in it and the benefits offered at production in terms of cost, time and less scrap. In the end, its value for the customer. Raleigh labels laser-cut bicycles with a sticker that touts "Laser Robotic Technology".This cutting system used on frame tubing functions in a manufacturing cell of its own [See Cellular Manufacturing], and needs only occasional monitoring by an operator. So lets take a look at how this robot works and builds bicycles. Note : I can't remember where I obtained this article from...sheepish grin. Machine shops producing prototypes or varying volumes of customized metal parts are finding that automated laser cutting systems provide simplicity and achieve high quality. Raleigh Industries of Canada Limited in Waterloo, Quebec has reduced a five-step manual cutting process down to two steps by using a robotic Nd:YAG (neodymium-doped yttrium-aluminum-garnet) laser cutting system. Immediate benefits of the robotic laser cutting system are cleaner cuts, consistent parts and reduced labor. Raleigh is the first Canadian bicycle manufacturer to use laser cutting in the production of the front triangle of the main frame for its 156 styles of youth and adult bicycles. The laser cutting cell is designed to perform complex cuts for tube-to-tube joints that are difficult to achieve with conventional cutting systems. The system is essentially a hands-off automated cell that needs only occasional monitoring by an operator. Laser cutting also produces very little scrap. Raleigh purchased the system from Hobart Brothers of Canada Limited which, acting as the systems integrator, took responsibility for cell concept, specification, integration and installation. The system was designed to cut complex, precise profiles on various gauges of mild steel and chromoly tubes. The system features a Hobart HLP 750 Nd:YAG laser, a Motoman K10ASB industrial robot with an ERC controller, and Hobart's high-speed Z end effector. The cutting system was installed in November 1994 and currently is cutting 1600 bicycle frames per day. The frames include three types of tubes--top, bottom and seat. Raleigh offers a lifetime warranty on its bicycle frames, thereby making sturdy construction fundamental for the company's success and profitability. The foundation of the bicycle is the tube assembly that forms a diamond-shaped base. A main vertical support tube extends from the seat to the pedal. A front triangle is formed with two tubes (top and bottom) that connect the seat tube with the steering handle and front wheel column tube. A back triangle is formed with top and bottom tubes connecting the main seat tube with the back wheel component. The angle of the top and bottom tubes determines the style and size of the bicycle. High quality welding to connect these tubes is essential to the bicycle's foundation. "We have found that consistency in tube parts is crucial to our success in welding," said Jim Wilkinson, industrial engineering manager for Raleigh's manufacturing facility in Waterloo, Quebec. "Our experience shows that laser-cut tubes are more accurate and consistent than those cut by end mills." Hobart Brothers of Canada Limited contracted with NuTech Engineering, a Canadian systems integrator, to construct the laser cutting cell and the tube feeder system. The cutting cell features a laser light-tight safety enclosure with access doors that interlock so that the laser can be activated only when the doors are closed. A 12-by-12-inch view window allows visible light to pass but blocks laser light specifically, enabling an operator to monitor the cutting process. The cell is a CDRH Class 1 enclosure, measuring 10 by 12 feet. The tubes are purchased in 20-foot lengths and delivered in bundles of 200. These bundles are stored according to gauge and diameter on a loading dock area. A crane then transfers a tube bundle into a NuTech-designed loading hopper that is part of the laser cutting system. A gravity feeder automatically downloads the tubes one at a time through a doorway into the laser cutting cell. An indexer in the cutting cell grabs the tube as it enters and pushes it out to the programmed length (from zero to 36 inches), as is required by a particular bicycle size. The only manual adjustment in the cutting cell is the collar on the indexer. The collar must be adjusted to accommodate various tube diameter sizes. Although all cutting occurs inside the main enclosure, the laser power source is located outside the cutting cell. This Nd:YAG solid-state laser was manufactured by Hobart Laser Products (Livermore, California). To withstand industrial environments, the laser meets NEMA 12 standards. The YAG crystal (cylindrical in shape with optically polished ends) and two arc lamps are mounted at the top of the power source enclosure in a water-cooled pump chamber. The crystal is optically excited by the arc lamps to produce the laser beam. Arc lamp life averages 400 hours, and lamps can be changed without opening the laser optical cavity. The controls, power supplies and other equipment are contained in separate bays of the enclosure. The 750-watt laser beam travels via an optical fiber cable into the cutting cell. The cable assembly includes a single fiber housed in an armored jacket with special connectors at each end. The beam is launched into the fiber with a lens system that focuses the laser beam into the fiber. At the output end of the fiber, another lens system, called the end effector, focuses the light into the workpiece. The laser beam has a wavelength of 1.06 microns, which is not in the visible range. The Motoman robot performs the scalloped or wave-shaped cuts on the tube ends. These curved shapes are necessary to provide a good weld fit-up between the top or bottom tube and the vertical seat tube on the frame. The five-axis articulated robot with a two-axis trepanning head ensures the tubes are cut to the required specifications. An additional coordinated axis in the robotic system rotates the tube during the cutting process. The ends of the tube are also dressed, or finished, eliminating the need for cleaning before welding starts. A unique feature that has been designed into the cutting cell is a steady rest that secures the tube during the cut. Upon completion, the rest releases the cut tube and places it gently into a load bin. If there are any end scraps, they are transported similarly by the steady rest into a scrap bin. To achieve a cut, a lens focuses the laser beam onto a material's surface. Raleigh uses an assist gas, oxygen, which is delivered coaxially about the focused laser beam. The relative motion generated between the beam and the material produces a kerf, or cut. Laser power, speed and assist gas are the prime components of laser cutting. Controlling the distance between the cutting nozzle and the workpiece significantly impacts the quality and success of laser cutting. When performing a complex cut, it is important to know exactly where the material is located. Raleigh is using Hobart's recently introduced high-speed Z end effector, which uses capacitive height sensing and an independent Z axis to maintain proper nozzle-to-workpiece position. It is a noncontact device that senses a metallic surface with a great deal of accuracy. The amount of programming is greatly reduced when using the high-speed Z because only the path is critical and the height sensor compensates for minor part variations. The all-electric industrial robot and YASNAC ERC controller coordinate the tube feeding system, activate the HLP 750 laser and the high-speed Z end effector, as well as process all input/output signals. The ERC controller is the system's central intelligence used to program the laser cutting system, to detect problems in any phase of the operation, and to protect the system by shutting down the laser whenever a problem does occur. "Our greatest challenge in this whole system has been properly lining up the feeder bins for the 20-foot tubes so that a tube does not jam as it is entering the cutting cell," said Mr. Wilkinson. "If the tube piece doesn't go in correctly, the cutting system immediately shuts down until an adjustment is made." Upon completion, the cut tubes are transferred to the next production phase, which is robotic gas metal arc welding (GMAW). Raleigh uses GMAW laser-cut tubes to produce frames that are light-weight, an important consumer feature. The laser cutting system was added specifically to enhance the welding process at Raleigh. "Welded frames became the technology of choice when mountain bicycles made their advent into the marketplace during the 1980s," said Ron Hanson, vice president of sales and marketing, Raleigh Industries of Canada Limited. "Suddenly, weight became an important issue for bikers." Prior to welded frames, Raleigh produced lug frames for the front and back triangle frames. In the manufacture of lug frames, the tubes were cut manually to a required length with a milling machine. One end of the cut tube was inserted into a lug, which was a pre-formed metal piece made into the desired angle for a particular bike frame. Lugs came in different sizes and shapes to fit a variety of tubes. A brass charge contained in the collar of the lug melted during a brazing process. As the melted brass cooled and solidified, a brazed joint is formed between the tube and lug. Upon inspection, if rework was needed, it had to be done by hand. Finally, the bicycle frame went through a pickling procedure to clean off the black residue left by the flux from the brazing process. "Obviously, this was a very time-consuming, labor-intense and potentially dangerous process," said Mr. Wilkinson. When Raleigh began making changes in the bicycle design to respond to the consumer demand for mountain bikes, the Waterloo facility had to look at different methods of welding the frame together. Welding was an impressive alternative because it maintained quality consistency, which ensured Raleigh's high manufacturing standards. With welding, metal is fused to metal, eliminating the high costs of brass charges and pre-fitted lugs. "Welding was a less expensive manufacturing process that produced stronger joints and looked more attractive. So welded frames quickly replaced lug frames," said Mr. Wilkinson. Serious competition with welded frames immediately came from off-shore manufacturers that were using manual gas tungsten arc welding (GTAW). In this welding process, a shield gas or gas mixture is used in the arc between a tungsten (nonconsummable) electrode and the metal piece. As the metal heats up, it coalesces to achieve the weld. GTAW is typically done manually and requires a highly skilled welder. Low labor costs in off-shore countries offer an advantage in using the GTAW process. So Raleigh Industries looked for a viable welding alternative. As a solution, Hobart recommended automated GMAW using a robot. This process uses the intense heat of an electric arc to melt filler metal and the base metal. The consumable bare solid electrode wire is continuously fed into the arc. As the wire is heated, the liquid metal melts off the end of the electrode wire and is transferred through the arc to the metal piece, forming the weld. GMAW can be automated very successfully, thereby eliminating the need for skilled labor. Automated GMAW proved to be three to four times faster than GTAW, which cost-justified the bicycle manufacturer's expenditure for this technology. 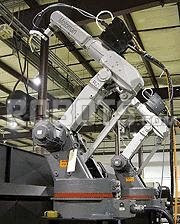 Raleigh installed its first Motoman robot for GMAW in 1990, followed by additional welding robot purchases in 1992, 1993 and 1994. In all, Raleigh utilizes eight robots for GMAW. The company has learned over the last few years that accurate, consistent parts are essential to successful automated welding. The milling machines and punch presses that were used to cut the tubes prior to the installation of the laser cutting system had been purchased thirty years ago when the Waterloo facility was built by the Thistle Company, a manufacturer of baby strollers, carriages and juvenile tricycles. Raleigh Industries of Canada Limited bought the facility in 1972 and switched the production to youth and adult bicycles. "During the last several years, it has become increasingly difficult to find replacement parts to repair the milling machines and punch," said Mr. Wilkinson. "The difficulty with end mills is that they became dull quickly when used on chromoly tubes. It was also hard for a mill machine operator to have control in locating parts in multidie end cuts," he continued. In addition, the labor was still very intense with milling machines and punch presses. First, the tubes had to be cut to the required length and then cleaned. After the first two processes, they were placed in end mills that notched out the tube ends for weld fit-up. Optional holes such as water bottle slots had to be punched by a hydraulic press, yet another separate process. Then the tubes had to be cleaned once again before welding could occur. A milling machine changeover to another bicycle style required costly production downtime and different hard tooling like plates, drills and punches. "With robotic laser cutting, we manually load the tubes into the feeder bin and then transfer the finished tubes to the welding area. The laser cutting program handles everything in-between. An indexer positions and rotates the tube during the cutting process while the laser and robot perform all the cuts that are programmed. Changeovers are simple program changes," said Mr. Wilkinson. "The result is a dressed tube ready for welding." The immediate investment into laser cutting technology is offset by the reduction of labor that end mill cutting incurs. Raleigh estimates that in three to four years they will recover their investment. How important is laser cutting to the purchaser of a Raleigh bicycle? Important enough that Raleigh labels laser-cut bicycles with a sticker that touts Laser Robotic Technology. "That label indicates to a potential buyer that the latest technology has been used to produce the sturdiest bicycle Raleigh can offer," said Mr. Hanson, speaking from his sales and marketing perspective. "It definitely influences purchasing decisions." Apparently, even the lasers used to make the bikes are doped these days. Sad. That article was hilarious! Sounds very impressive however, what you end up with are some of the heaviest, poorest quality, department/toy store bikes on the market. Raleigh Canada is it’s own entity and should in no way be compared to Raleigh bicycles sold anywhere else in the world. For those of you in America, think Huffy. The process described is in no way fool proof. I’ve seen bikes pulled out of the box, painted, ready for final assembly only to find a downtube with a weld bead all the way around it but not at all attached to the headtube. We’re talking some serious QC issues here. Raleigh Canada was at one point one of the largest selling low end IBD brands in the country. As of a few years ago they have sold out to Canadian Tire a large big box chain and remain in only a very few IBD’s. Very depressing. No sharks mentioned in the article at all.